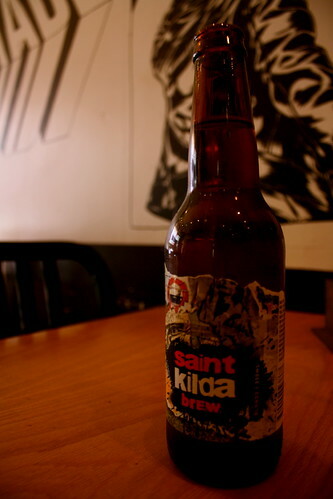 After a heavy breakfast at the hotel, I decided to go check out St. Kilda. I got on the free tram, and ended up on Swanston Street again. I then took tram 3A ($4 for a two-hour window). The trip took about 20 min, and went past some nice spots like Royal Botanic Gardens, and Fitzroy street shopping. 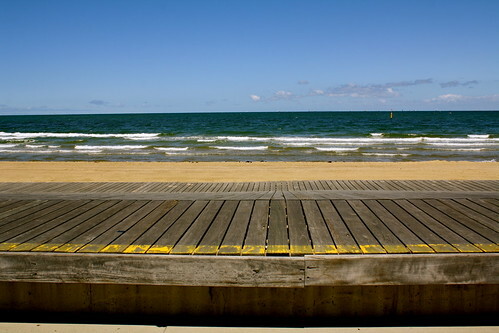 St. Kilda beach is pretty nice. It’s clean, and has a nice boardwalk for those who want a stroll. It wasn’t particularly crowded when I was there, though I didn’t go take a dip in the water for a temperature check. As it’s Sunday, they also have a Sunday market. Not too shabby for a short trip from central Melbourne. 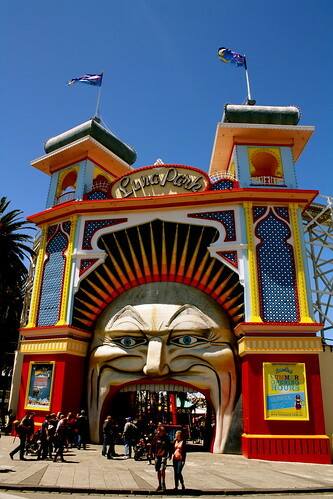 After my brief stroll on the beach, I decided to check out Luna Park, one of the few left in the world built from about 100 years ago. 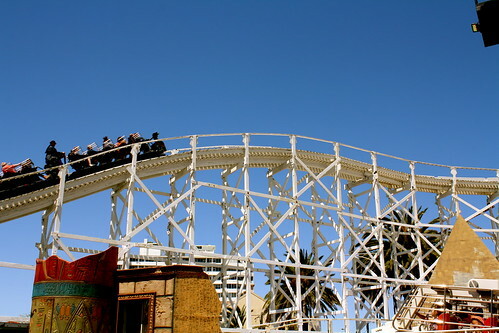 This particular one was built in 1912, and it has the oldest, running wooden roller-coaster in the world, called the Great Scenic Railway Roller Coaster. Entrance into the park is free, but you have to pay for the rides. You can either get the unlimited ticket pass ($45-49) or pay $10 per ride. It is pretty cool visually. 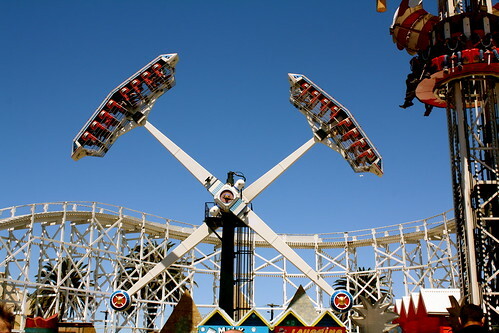 It rides on the perimeter of the park, including on top of the big mouth entrance. There’s also a guy standing on the roller coaster, operating it. After trying out some of the arcade games, I decided to explore the St. Kilda area for some grub. Many of the places are really expensive. The area is nice, though. There are several cute shopfronts for the food places. 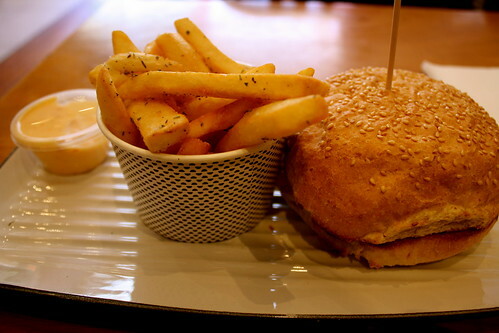 After exploring a little, I decided to have a place called Grill’d, which sells burgers. I was pretty full, so I went for a Mini Moo ($9), with chips ($3) and a St. Kilda’s beer (4.5% alcohol, $7.50). The patty was nice, but the bun to patty ratio was a bit off – too much bun, though the bun was definitely good. After my filling lunch, I decided to go back to Melbourne via another tram – 96. Thankfully, I managed to do all this within the 2 hr window, so I saved some money there!